Submitted by Quest-News-Serv... on Sun, 12/13/2009 - 03:59. Lawyer sues traffic and parking courts in Indianapolis, Indiana over threatened $2500 penalty for contesting a ticket in court. Motorists who receive minor parking or traffic tickets in Indianapolis, Indiana are being threatened with fines of up to $2500 if they attempt to take the ticket to court. A local attorney with the firm Roberts and Bishop was so outraged by what he saw in Marion County traffic court that he filed a class action suit yesterday seeking to have the practice banned as unconstitutional. "The deck is stacked against the motorist," lawyer Paul K. Ogden wrote. "To penalize that person for seeking justice seems wrong. I know it is done for the purpose of discouraging baseless challenges to tickets and clogging the docket, but in the process you are also penalizing people who have a legitimate defense and want a chance to present it to the court." The city made explicit the threat of additional fines for challenging parking tickets in a November 30 press release announcing a deal between Indianapolis and a private firm, T2 Systems, to hand over operations of a parking ticket court to increase municipal income. "Using Six Sigma process improvement strategies, it is estimated that under this program the city may collect an additional $352,000 to $520,000 in parking citation revenue over the next 12 months," the city press release stated. "If citations are not paid prior to their scheduled hearing, the city may request a fine of up to $2500 per citation. Upon receiving a judgment for an unpaid citation, individuals responsible could be subject to collections actions or having their vehicle registration suspended." In traffic court, Judge William Young has been making good on the threats by routinely siding with police officers in disputes and imposing fines of up to $500 on anyone who challenges a moving violation ticket, no matter how minor, and loses. Those who pay without going to court do not face this extra fine. "Unfortunately what you have happen a lot of times is that judges aren't particularly worried about whether what they're doing may be violating the law as the odds of someone ever appealing a $400 traffic ticket is remote," Ogden wrote. "I see it all the time. Trial judges flouting the law knowing they are unlikely to ever be challenged on an appeal because the litigants can't afford it." 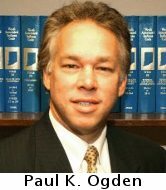 Ogden is specifically representing three motorists affected by court policies. Toshinao Ishii received a ticket for driving 63 MPH in a 55 zone in February. Had he paid the ticket without challenge, the fine would have been $150. After Judge Young sided with the police officer in court, Ishii was fined $550. Motorist Matthew Stone was told by his doctors not to wear a seatbelt over his chest as it could damage his cardiac pacemaker. He received a $25 ticket for wearing his seatbelt "improperly." After reading that he would face a $500 fine, Stone gave up his intention of challenging the citation. Adam Lenkowsky, who did not receive a ticket, attempted to attend a traffic court proceeding on September 23, 2009. He was barred from the court, despite the state constitutional requirement that court proceedings be open.